“Magnetic materials that form helical structures—coiled shapes comparable to a spiral staircase or the double helix strands of a DNA molecule—occasionally exhibit exotic behavior that could improve information processing in hard drives and other digital devices. 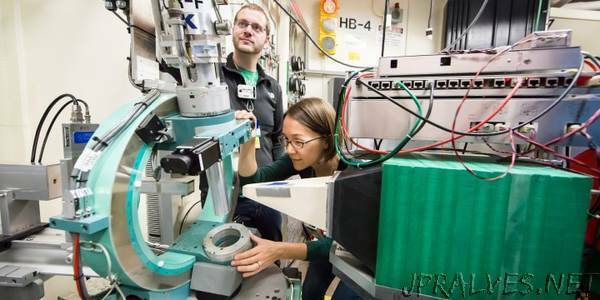 A research team from Colorado State University is using neutrons at the Department of Energy’s (DOE’s) Oak Ridge National Laboratory (ORNL) to study one such material, Fe3PO7. Although helical structures are typically formed by magnetic moments that wind around an axis in a set direction, the researchers discovered that Fe3PO7 does not pick a particular direction and allows only short-range helical structures to form. These structures may provide novel technological capabilities. “Because the direction of the helix is varying in space, it has what we call a partial order, which means there is no set direction for the helical axis to point,” said assistant professor Kate Ross, who is also a former chair of ORNL’s SNS-HFIR User Group. By determining Fe3PO7’s magnetic structure using the Four-Circle Diffractometer instrument, beamline HB-3A at ORNL’s High Flux Isotope Reactor (HFIR), the researchers hope to identify the underlying factors contributing to this unusual helical magnetic structure. Neutrons have their own “spin” (an intrinsic momentum), making them sensitive to magnetism inside materials, which means they are the ideal tool for the task. The team’s small crystal sample is antiferromagnetic, meaning that each spin on the atomic lattice attempts to face in the opposite direction of its neighboring spin. However, Fe3PO7 forms a lattice based on triangular units that makes this arrangement impossible, resulting in an atomic deadlock called “frustration.” These key qualities may inform the team’s investigation of the unconventional magnetic structure. “We think there is one exciting possibility that could potentially explain this material’s partial helical order and short-range correlations, both of which are unusual to see in a solid-state material,” Ross said. This phenomenon could be caused by twisted regions of magnetization called “skyrmions” that disrupt magnetic spin patterns. According to Ross, these antiferromagnetic, “hedgehog-like” defects could advance the field of spintronics, which involves manipulating electron spin to improve magnetic information storage and other applications. After analyzing their data, the researchers plan to conduct additional studies focused on the dynamics of Fe3PO7 to confirm this scenario. Ross has studied frustrated magnetism since her undergraduate years, and the subject continues to fascinate and inspire her today. She describes her team as explorers seeking interesting magnetic phases who often arrive at unexpected conclusions.